Today, I’m going to talk about comfort. Because my pants don’t fit a lot of gear. And opening my bag every time I need something is a hassle. With a multipocket survival vest. 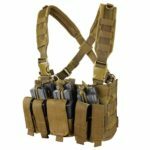 A survival vest is one of the best ways to beef up your bug out loadout that nobody is talking about. Survival vest is one of the best ways to add flexibility to your bug out gear. If you do somehow get separated from your bug out bag, you’ll still have all the equipment that you need to survive on your body. Vests are always a good idea. Having a packed and ready survival vest at home just in case won’t hurt. Best case scenario – you’ll take with you fishing, hunting, camping or hiking. It’s simply one of the most versatile pieces of clothing you can have. Survival vests were originally used by pilots. The idea was that if you ejected from the aircraft, you’d still have all of your emergency survival supplies with you. So that you’d last long enough until the help arrived. For pilots – having a survival vest is a matter of life and death. During the Second World War, allied aircrew routinely wore vests with enough gear to (hopefully) survive and escape in case they got shot down behind the enemy lines. Same thing in Vietnam. That’s when the modern aviation survival vest was first developed. In addition to pockets with survival essentials, the vest had harnesses for hoisting aircrew into helicopters. Today, some form of the survival vest is used by all military pilots. It’s also popular among civilian pilots – backcountry pilots in particular. But there is a key difference between survival vests for pilots and survivalists. Pilot’s survival vest is his only means of survival in a plane crash scenario. Prepper’s survival vest is only one part of his survival gear. Different needs – different loadouts. So, let’s take a look at what’s important to know about survival vests for prepping. The weight of your vest is key. A good survival vest will be lightweight. It’s going to complement to your bug out bag – not replace it. Because it’s easy to keep packing on more and more gear. Not a wise thing to do, though. All that extra weight will drag you down if your bug out route is longer than a few miles. Your average mil-spec vest will weigh a couple of pounds on it’s own. Now load it up with gear – and all of a sudden you have 5+ lbs. of extra weight on you. Not good. You want to have quick access to your gear. Whether it’s your water filter, or your gun and your blade. Bonus: A large back pocket on your vest for tarp/down/emergency blanket. In case of a serious emergency, all bets are off. Your gear needs to be rugged and reliable. Properly packing your survival vest is important. Fortunately – it’s not as complicated as packing a bug out bag. You can still accomplish a lot with your survival vest alone. If you think outside the box. For example, you can have a small cooking pot packed full of small items in one pocket. Don’t forget a firestarter (a few drops of hand sanitizer will do). Maybe you need your handgun to be accessible at all times? If your vest has a large back pocket – you can use it to store your entire sleeping system. But of course – take a hard look at YOUR needs and circumstances. I must admit – I was heavily inspired by the below video. The video below goes into extreme detail on how to pack your survival vest. Highly recommended. Let me tell you why I believe that the 5.11 Tactical Taclite Pro is the best survival vest on the market. As we discussed earlier, lightweight survival vests are better than heavyweight ones in most cases. And this Taclite vest is incredibly lightweight at 0.4 lbs. I couldn’t find this kind of functionality at such low weight point elsewhere. You’ve got Ripstop fabric and quad-stitching durability even at this low weight point. There are 17 pockets on this vest, including mag pouches and even a hidden handgun compartment. There is also a large back pocket. Note: some of the pockets are hidden inside the vest, which is why you can’t see them from the image. 5.11 is also a well-known tactical brand. This is not some random Chinese thing off Amazon. The price is a bit high compared to other light vests, and that’s the only real downside here. But you get what you pay for. A whole lot of functionality for the money. Finally – this vest looks subtle. It doesn’t scream “I have a gun” like some of the heavier vests out there. And I like that. So I say it’s worth the money. The Taclite pro is the best (lightweight) survival vest for most of you folks out there. Durable and versatile – you can’t go wrong with this baby. Tad bit expensive, but you’re paying for quality. 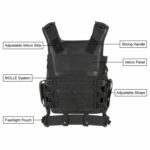 Condor Chest Rig is made with Mil-Spec materials. It’s meant to be used out in the field. This is what real servicemen are using. We’re talking duty-level quality here. 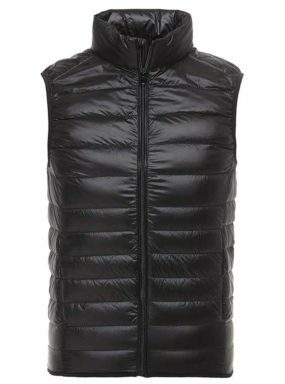 Which is great, because rig is also one one of the most affordable “vests” on the list. The rig comes with 3 built-in magazine pouches. 3 additional pockets behind central rig and in seams behind shoulder straps. Note: The 3 pouches can fit 6 M4 mags and 6 pistol mags.But you can also use them to store small survival gear. MOLLE webbing on the straps allows you to attach additional gear pouches. You will look like a professional soldier wearing this thing. Up to you to decide whether that’s a good or bad thing. Rothco Uncle Milty is not your normal tactical vest. No mag pouches and gun holsters here. This is more of a camping/hiking/traveling vest. And let me tell you why that’s a good thing. This is the most subtle-looking vest on the list. You can wear this one anywhere – without raising eyebrows or looking suspicious. Still a good choice for survival because of the 17 pockets – most of them on the outside. At 1.15 lbs. Uncle Milty is about twice as heavy as the Taclite above. It’s still very light compared to the heavier military vests. The price is great for what you’re getting. Rothco Uncle Milty is great for everyday situations – camping, hiking, fishing, travel, photography etc. This vest is not made for heavy outdoor use. The fabric is on the thin side, not ripstop. Most likely, it will survive a full-blown SHTF scenario. It’s just not as rugged as the 5.11 taclite above. This is a proper MOLLE vest. Sturdy nylon mesh and webbing everywhere (front, back, sides). It’s Mil-Spec – and adjustable. Just like the ones that the military uses. In addition to MOLLE webbing everywhere, you get two interior map pockets. The large back pocket can easily hold a 100-oz. water bladder. 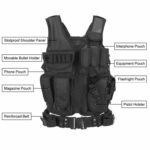 Tactical MOLLE vest is one of the most versatile pieces of gear out there. The beauty of MOLLE is that you can attach anything to it. You can put gear wherever you have webbing. But – that’s also one of MOLLE’s shortcomings. The vest needs a lot of manual customization before you can use it. The vest is also on the heavy side – especially when you start attaching pouches to it. And that’s another point – you’ll need to buy pouches for this vest separately. And that’ll cost you quite a bit, unless you get them from a milsurp store. Great tactical vest, perfect if you enjoy tinkering with your gear. As a survival vest, it will be heavy with all the additional pouches. You should only get this vest if you know what you’re doing. Beginner survivalists are better off with Rothco or Taclite. Another Condor on the list! The Ronin rig is somewhere between the first Condor and a full-blown MOLLE vest. The specs are same as the first Condor vest. Except for the weight. This thing is only 1.3 lbs.. The light weight makes it a contender for the title of the best survival vest in my book. 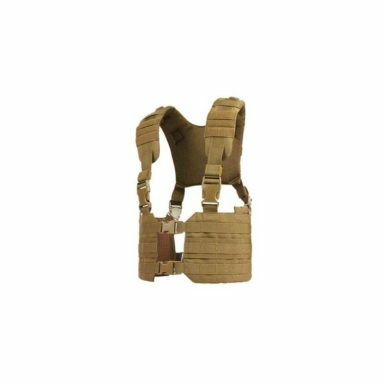 At the same time – you’ll need to buy additional MOLLE pouches to really utilize this vest. 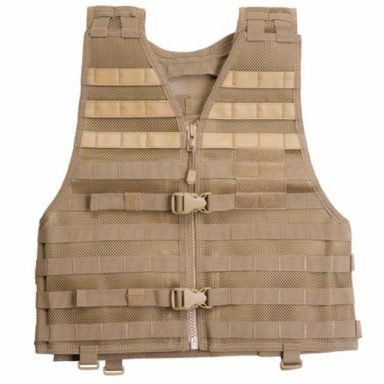 This vest is for you if you want a lighter version of a MOLLE vest. Remember – lighter=better for survival. Didn’t expect this one, huh? 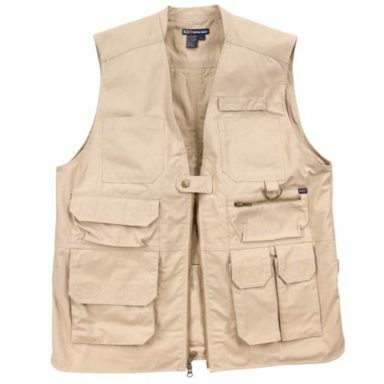 Down vests don’t get the love they deserve in the prepper community. And I’m here to change that. Because a down vest can save your life if you get caught in the cold without proper clothing. Made out of real feathers – this thing is warm. Not bad for something that literally fits inside of your jeans pocket. The beauty of down is that you can compress it to be extremely small. Meaning that you can store them anywhere, without taking up space. Side note: I keep three of these in my car at all times for me and my family, and recommend you do the same. At 3 pounds the Barbarians vest is on the heavy side. Load it up – and you’re looking at 5 lbs. at least. You’re getting 15 pockets with a rear MOLLE panel for additional pouches. This thing will take all the gear you give it – and more. This heavy-duty customizable vest comes at an very affordable price. This vest is too heavy for an all-rounder survival vest. All that extra weight will wear you out when bugging out. So unless you have a specific use in mind – where you’d be needing a heavy-duty tactical vest – I’d suggest going with something lighter. Survival vest is a piece of gear that every survivalist should have. I hope you see the appeal. Because there are literally no downsides to having one. In exchange for what? A 0.4 lbs. weight difference? You can load it up with small survival essentials and not even notice that you have it on. Final note: you shouldn’t use your vest to carry more gear. It’s not there to replace your bug out bag. But when SHTF – you never know when you’ll be needing all those extra pockets.